Upgraded to Windows 10? Many people have! So, you have upgraded to Windows 10! What do you think? So far the opinion from those that have upgraded to Windows 10 seems favorable. If you have upgraded to Windows 10 you will find a lot of new features as well as some old familiar ones too. To start with the start menu is back, Yay! Although it is enhanced with some Windows 8 features like the live tiles, it brings back a lot of the functionality that many users were familiar with in both XP and Windows 7. If you are a new Windows user you will get on fine, if you have come from 8, 7 or XP there will be plenty there that will let you do what you want to do without too much head scratching! 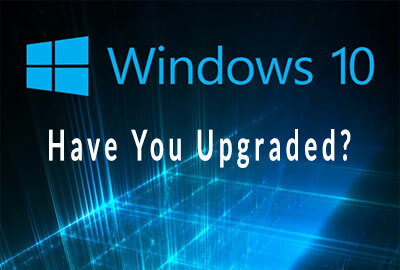 According to Microsoft this will be the last version of Windows and will be continually upgraded, we will see! One of the big new features when you upgraded to Windows 10 is Cortana, the digital assistant program. It’s very impressive, but you will need a windows live account and also Cortana is a bit of a data hog. You might want to be aware that you could be sending Microsoft your personal data without knowing it! Obviously this feature can be turned off, but it is not initially easy to figure out how to deactivate it. If you have upgraded to Windows 10 you will also notice a new browser called ‘Edge’. Edge looks and performs very well, especially compared to Internet Explorer ( Unfortunately over the last few years I went completely off IE and moved over to chrome and Firefox due to various problems and bugs I was encountering. It seems that I was not alone!). One of the great features of edge is the ability to make permanent notes and comments on websites, as well as being able to draw on it with the pencil tool. The new operating system is built to work well across all devices from desktops to tablets and phones, it might look slightly different, but all the functionality is there. If you are using it on a smartphone you will notice that the start menu is gone and replaced with a tile style interface that works very much like Windows 8 did. I have many customers that have upgraded to Windows 10. Out of all of them I have had only two that got me to roll their systems back to Windows 7. In both cases when they upgraded to Windows 10 it caused their systems to run really slowly. I could have tweaked it to make it run faster, but they requested that I roll it back to 7 as they were not experiencing any problems before they upgraded to Windows 10. For those that don’t know, if you have upgraded to Windows 10 within the last month it is really easy to roll back to Windows 7 or 8. Open the start menu, go to settings, then click the update and security tab, then hit recovery. If it has been less than a month since you upgraded to Windows 10 you should see an option to roll back to you previous operating system. I have not personally upgraded to Windows 10. I run Windows 7 on all of my systems. At this point in time everything is working fine for my business and I am very happy with Windows 7. It’s like they say “if it isn’t broke, don’t try and fix it!” Well mine isn’t broke right now! I find Windows 7 is very stable and great to use for my personal needs, and will hopefully be supported by Microsoft for some time to come. I am sure that I will be upgrading at some point in the future, but probably not until they release service pack 1 or whatever they decide to call it. I believe that Microsoft have just released the first update for Windows 10 as I am writing this. So there you have it, I like Windows 10 but I am going to hold out for a little while longer! Tablet or Laptop, What Should I Buy?